Love and Gelato, by Jenna Evans Welch (book review) – Italy! Family! Really?? After her mom’s death, Lina is bombarded with changes – moving to Italy where her mother studied photography in college, meeting the dad she never knew, maybe even falling in love! But it’s all so fast, and the entries in her mom’s journal are like a puzzle that she must solve, even if the answers raise more questions! Family secrets – unearth them or let them stay hidden? 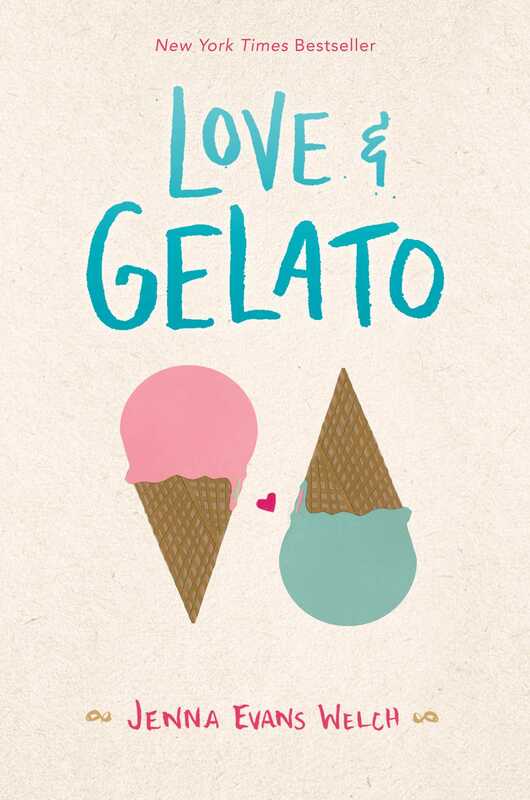 Book info: Love and Gelato / Jenna Evans Welch. Simon Pulse, 2016. [author site] [publisher site] Review copy and cover image courtesy of the publisher. My book talk: Leaving Seattle for sunny Italy, Lina mourns her late mother, worries about meeting her father for the first time, and is sure that going to school in a new country will be terrible, until her dad’s co-worker brings the journal that Mom kept while she was a photography student here and Lina meets the cute Italian-American guy next door. Mom’s journal brings up so many questions – what does “I made the wrong choice” mean? Her dad Howard is a nice man, but why doesn’t Lina have even one physical feature like him? Ren helps her find all the places Mom mentions in her journal, but is he just interested in Lina as a friend? 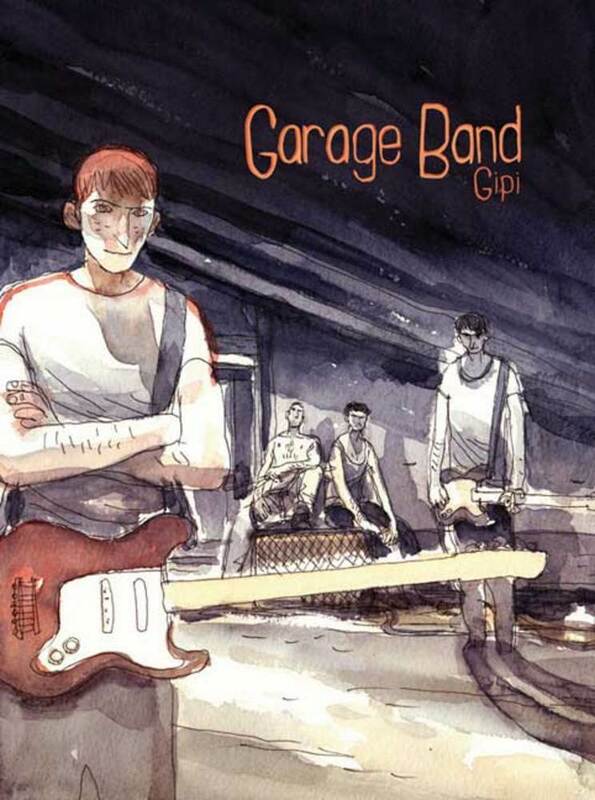 G is Garage Band, graphic novel by Gipi (book review) – guys+music=rock band? The new band’s problems, from equipment problems to practice schedules, mix with Gipi’s gritty sketch-plus-watercolor art to show just how far four working-class Italian teens will go to make their music. This 2007 graphic novel is still in print, definitely worth your time to read. Have you ever given it your all striving for a goal? Book info: Garage Band / Gipi; translation by Spectrum. First Second Books, 2007. [artist/author info – English] [artist/author blog – Italian] [publisher site] Review copy and cover image courtesy of the publisher. My book talk: When a blown amplifier short-circuits their band’s big audition, four Italian teens must decide whether their integrity or their potential rock music future is more important in this graphic novel by Gipi. If he’ll stay out of trouble, Giuliano can use his dad’s old garage – perfect place for the band to practice! Also a refuge from the not-so-wonderful family lives of the four guys in the band: Giuliano (obsessed with his music even more than with his girlfriend), Stephano (obsessed with dread diseases after his brother died), Alex (obsessed with all things Nazi after his father fled), and Alberto (obsessed with his father’s precarious health). Stefano’s dad gets the guys a chance to have a record company listen to their demo songs, so that means lots of practice. Then their old amp shorts out and can’t be fixed – now what? “Borrowing” some equipment, that’ll work! 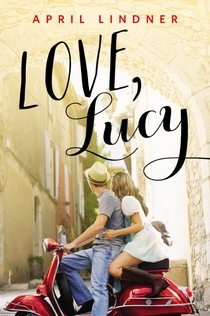 Love, Lucy, by April Lindner (book review) – Italy, love, goodbye forever? And then Lucy must give up her theater dreams to become a business major, or her father won’t pay for college at all! Hard choices…and Jesse back in Italy so hard to get in touch with. Read the first 2 chapters on the publisher’s website free here as you listen to the author’s Love, Lucy playlist, and you’ll be whisked away to Florence with Lucy, love just around the corner. This modern interpretation of E.M. Forster’s classic A Room With a View comes from the author of Catherine (based on Wuthering Heights – my review here) and Jane (Jane Eyre). Could you give up true love for family demands? Book info: Love, Lucy / April Lindner. Poppy, 2015. [author site] [publisher site] Review copy and cover image courtesy of the publisher. My book talk: Giving up her dream of being an actress is hard for Lucy, but giving up the young man she loves so her dad will pay for college is heartbreaking – must she really choose? Her ever-practical father reluctantly allows Lucy to backpack through Europe with Charlene after high school graduation, in trade for Lucy majoring in business (which she hates). When Lucy meets Jesse in Italy, she delights in the beauty of Florence, the shimmer of Tuscan sunlight, the warmth of his kisses. However, her troubadour intends to continue traveling abroad, playing his guitar, not returning to his family in New Jersey any time soon. So it’s a tearful goodbye at the train station, a sad flight back to dad’s alma mater. Spying a poster for theater tryouts puts some pep in Lucy’s step – why can’t a business major be in a play? How can she reconcile her father’s demands with her love for performing? Why hang out with college boys when she can’t stop thinking about Jesse? Enjoy Curses and Smoke for its glimpses into the port city’s everyday life, its recounting of the weird phenomena observed prior to Vesuvius’ most famous eruption, its love story between owner and owned. 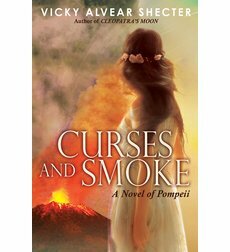 Book info: Curses and Smoke: a Novel of Pompeii. Vicky Alvear Shecter. Arthur A Levine Books, 2014. [author site] [publisher site] Review copy and cover image courtesy of the publisher. My book talk: As handsome Tag returns to her father’s gladiator school at Pompeii, Lucia’s unease about her upcoming marriage to an old man and the recent loss of her mother are echoed by the earth’s tremors. It was different when Lucia was a little girl roaming the hillsides and Tages was the medical slave’s small son at her side, before he was sent away to learn the healing arts in Rome, before her mother’s untimely death, before these sulfurous emanations near Vesuvius began. 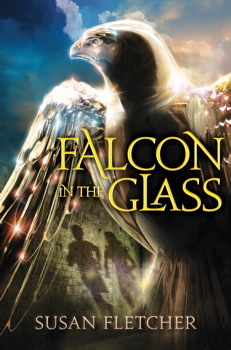 As Lucia tries to break her betrothal to elderly Vitulius and Tag tries to cure his father’s failing memory, rich young Quintus arrives at the school to play at being a gladiator – with a hidden agenda. Is there any way for Lucia to escape her dreaded marriage? Can Tag ever end his captivity in the gladiator school? Are the old Estruscan gods angry that Romans took their sacred grounds at Pompeii? Why will no one listen to Lucia’s ideas about the strange things happening? Ravens of Solemano, by Eden Unger Bowditch (book review) – journey of secrets, families lost? Mysterious coins and curious murals. Fabulous food, but no parents to share it with. The remote village hides the five Young Inventors and their teacher well, but it also hides many secrets, perhaps even the origins of the Mysterious Men in Black who guard, guide, and confuse them! Hopefully, its ravens can hide the children from evil Komar Romak long enough for them to solve a baffling problem which endangers the world. 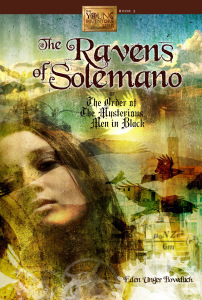 Just published on Sept. 24th, The Ravens of Solemano surprises with clever puzzles, endearing characters (except for Romak),and links to historical figures famous and obscure. Ask for it today at your favorite local library or independent bookstore – if they don’t have it, use the Book Info below to request it. Of course, you’ll enjoy these further adventures of the Young Inventors Guild even more if you’ve already read The Atomic Weight of Secrets (my no-spoiler recommendation here) , so check it out, too. If the expectations of the world are on your shoulders, can you ever put family first? Book info: The Ravens of Solemano: The Order of the Mysterious Men in Black (Young Inventors Guild, book 2) / Eden Unger Bowditch. Bancroft Press, 2013. [author site] [publisher site] Review copy and cover image courtesy of the publisher. My book talk: A daring escape, a too-brief family reunion, then the five Young Inventors must solve cryptic puzzles in a puzzling village before their dreadful enemy strikes again – now the world itself is in danger! Fortunately, their schoolteacher Miss Brett is with Jasper and little sister Lucy, Wallace, Noah, and Faye as they must travel across the sea from the explosion site where they spent such a short time with their parents, on the run from evil Komar Romak. The Men in Black hustled the children and Miss Brett to safety aboard the strangest ship, crewed by more like them. Such wonders in its library and labs! But a murdered man’s message sends danger their way, even before the Young Inventors reach the Italian village of Solemano with its ever-present ravens, mysterious garden labyrinth, and many puzzles to solve. Miss Brett helps the children settle in and resume their experiments – their inventive minds find much to ponder here. Underground passageways with possible clues, garden statues that are not what they appear to be, friendly villagers with secrets of their own. How long will the children stay in Solemano? The Men in Black who guard/protect them cannot (or will not) say. Has Komar Romak discovered their hiding place yet? Can the Young Inventors discover enough of Solemano’s secrets to protect themselves? Will they ever see their parents again? Lots of traveling lately on BooksYALove, especially on World Wednesdays as we look at life through the eyes of folks living outside the USA. Which is the real Australia – the remote Red Center where Gemma’s kidnapper has taken her, Stolen from her parents in a busy airport? The sleepy country town where Laura and Leon investigate the mysteries surrounding The Visconti House? Urban Sydney where The Reformed Vampire Support Group meets every Tuesday night, trying to keep out of temptation’s way? Deo loves soccer and his family – will he have either one left after fleeing a massacre? Now is the Time for Running as he suddenly becomes one of the many refugees struggling to enter South Africa. Maya’s trip from her birthplace in Canada to her parents’ homeland of India became a much longer and more perilous journey than she or her father ever imagined, as chronicled in the verse-novel Karma. When I Was Joe jumps right out of the headlines about urban London gang fights and the witness protection programme, followed by the gripping Almost True – yes, Keren David is writing a third book about Ty right now. Trapped between a massive glacier and the frozen fjord, Solveig and her siblings pray for rescue by their royal father, listening for Icefall, trapped in a mountain fort with a traitor. Louise suddenly went from the Connecticut suburbs to the decks and plush staterooms of the Titanic as she unwittingly became The Time-Traveling Fashionista. Of course, the River of Time series took us far away and far back in time, as Gabi and Lia traveled back to the 14th century from their archaeologist mother’s dig site in Tuscany. Swordfights, romance, and intrigue! Start with Waterfall (first in the series), then continue the adventure in Cascade and Torrent. Lisa T. Bergren is working on the next book in the series, after her recent trip to Italy for more research. More of the wide world coming up, as we travel soon to Iran, to the Moon, to the future, to Australia, and beyond with the BooksYALove (but won’t find on the bestsellers’ lists). Found this great statue of kids reading in Kingston, Jamaica.